June was an interesting month. The index fell around 3% from the tip when Greece announced it was unable to pay its debt payments to the IMF. 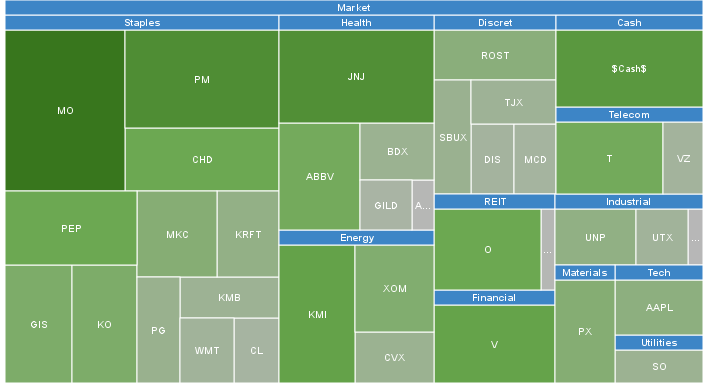 Several sectors continued to see continual declines most notably REITs and utilities. These are starting to become attractively valued after becoming severely overvalued earlier this year and I am becoming very interested in adding more to several companies I've been waiting for a long time. The drop in price comes from the expectation of a rate hike. My portfolio continues to experience new highs as my contributions greatly exceed any daily fluctuations in stock price. This will change as my portfolio grows. Eventually my monthly contributions will pale in comparison to the portfolio's total size and its monthly dividend payments; at this point market fluctuations will become more significant since my monthly contributions make little difference. The goal in financial independence is for the portfolio's monthly dividend payments to outsize one's monthly expenses. Below is my summary of my portfolio. Overall the total value has been relatively unchanged compared to last month. This is one of the benefits of diversifying across all sectors: stability. My financial independence portfolio comprises positions in my taxable account, 401k, and Roth IRA. My taxable account is by far my largest because I plan to enjoy my funds' dividend cash flow before I am at retirement age. The majority of my holdings have high investment grade credit ratings. Most have very long track records of paying increasing dividends. My objective is income replacement and this will be accomplished by continuously rising dividends every year from each of the positions. I reinvest my dividends in all my positions. I only purchase equities that I find attractively valued based off historical P/E or Price to free cash flow. Companies that are put into my portfolio must have strong credit ratings and dividend histories. I prefer companies that provide the world with products that everybody will use no matter the situation since this fact guarantees their cash flow. Hence, my heavy weighting in consumer staples. Equities in green are core. Yellow is supporting and Red is speculative. The portfolio is very close to churning out over $3600 in annual dividends. This will be a happy mark for me since that means on average every month I will receive $300 in dividends. This is already easily covering my food expenses. For the month of June I was fortunate to receive $308 in dividends. All of the cash was instantly reinvested back into the companies that payed them to empower the snowball. The for the month of June, I removed several positions that I felt were too cyclical to my investing style. The number of positions in my portfolio is starting to exceed what I prefer to monitor. My ideal target is under 40 equities and I still have several high quality companies that I still wish to own one day but are too expensive now. I added a small position in Colgate Palmolive last month, one of my favorite consumer staples companies. I also starter position in Gilead as a speculative position. I am currently heavy on staples and healthcare. I feel that the growing age of the baby boomer population will place great stress on our healthcare facilities and supplies. This will increase expenditures on healthcare expenses. I am starting to add more to my meager utilities positions. I see utilities as essential in one's portfolio. They may provide little growth but with dividends reinvested the utilities have outgrew the S&P500. It is the power of reinvesting the high dividend payments in low price utility stocks (which don't grow fast). In fact, the slower the utility stock price grows the better since that allows the power of dividend reinvestment compounding to have a stronger effect. The goal is share accumulation when one is still in their accumulation phase. Capital appreciation is only secondary to share accumulation and dividend increases. The consumer staples sector is my favorite because of its very predictable earnings. Even during recessions consumer staples have demonstrated that they can continue increasing earnings and dividends. Many of these consumer staples have been paying increasing dividends for decades. My portfolio's core foundation is built on names such as Altria, Pepsi, Coca Cola, General Mills, Church and Dwight, Philip Morris, McCormick, and Kraft (soon to be Kraft Heinz). 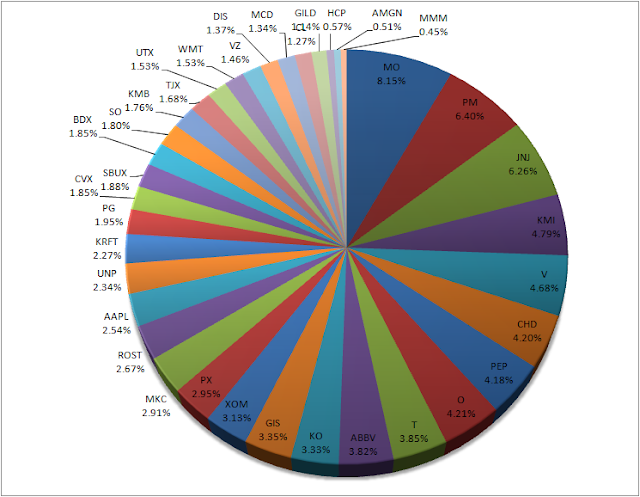 Most of my portfolio is allocated to core positions. I see this as absolutely important for anyone starting out. Only focus on the foundation before starting speculative positions which are rather unpredictable. Core companies must have solid credit ratings (BBB+ or higher), be on the dividend aristocrat list, and have predictable earnings. Below is an illustration of each equity weighting. My largest positions are Altria, Philip Morris (spun off from Altria several years ago), Johnson and Johnson, Kinder Morgan Inc, and Visa. Happy early fourth of July! Thats a really nice looking portfolio...lots of quality names. Congrats on the dividend income, YD. Churning out close to $300 per month is quite an achievement. Keep up the great work! Great looking portfolio and charts... Thanks for sharing and keep up the good work!